Of the list of features that will be available in iOS 8, the ability to add third-party keyboards certainly stands out. And while Apple didn't mention any of these keyboards at length in yesterday's iPhone event, that doesn't mean these third parties aren't getting closer to having a working model. SwiftKey is one such keyboard; it was one of the most popular apps in the Play Store for months, and it's also one of our favorites to use on Android. Fortunately, the company's nearly ready for beta testing. There's no word yet on how long these tests will take, nor how many people will get to try it out initially, but the company at least provided us with some details on what the keyboard will be capable of. As you can see above, one of the shining features of the new SwiftKey for iOS app is its swipe gestures. Just like SwiftKey on Android, as well as other 'boards like Swype, Sense and so on, it gives you the ability to glide your finger across the screen from one letter in the word to another. It also can learn from your typing, so it's able to predict what you're going to say more accurately as you continue to use it more. And thanks to SwiftKey's Cloud service, if you want it to learn your style even faster, just hook up your Gmail or Facebook account and it'll analyze what you type the most so the prediction engine continues to improve. SwiftKey isn't ready to discuss when it'll be available to the public yet -- nor how much it'll cost in the Apple Store -- or if the beta test will be open or closed. (The latter is most likely.) Still, this is a good sign that third parties are getting closer and closer to having finished iOS 8 keyboards ready to go, and hopefully many of them will be ready to go by the time iOS 8 hits general availability. The app, when it's ready, will come in several different languages: English, French, German, Italian and Spanish. We'll keep you posted as more boards are coming out in fully functional mode. 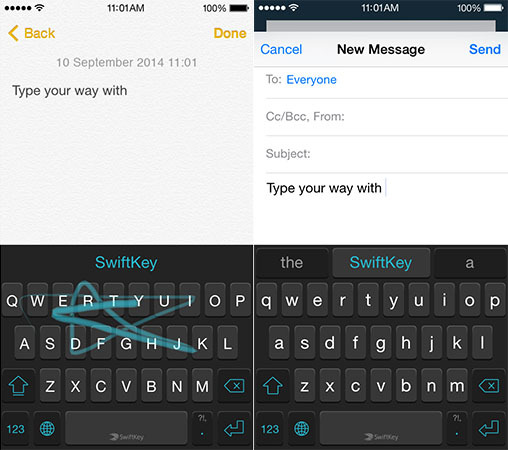 Update: We're hearing that SwiftKey is emailing users to let them know the iOS 8 app will be ready to download on the 17th, the same day iOS 8 is available to the public.